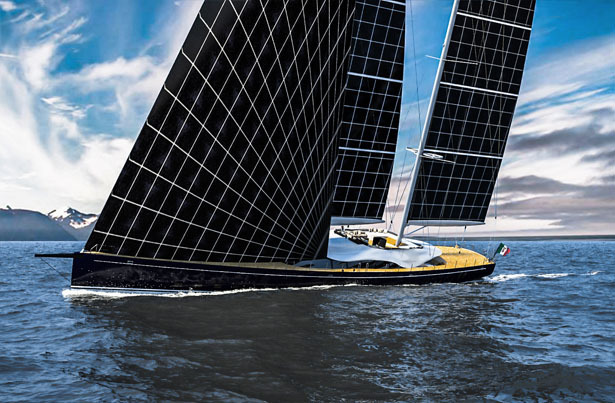 Italian designers Marco Ferrari and Alberto Franchi developed Helios, a solar-powered sailing yacht concept design for the Young Designer of the Year 2015 contest. Created with a low carbon footprint in mind, the 180.5-foot-long modern yacht can accommodate 10 guests and 8 crewmembers. Hello harvests solar power through its flexible solar cell-clad sails made of silicon. The surface area covers about 2,500 panels that can generate approximately 355 kWh of power. The luxury boat offers many amenities, from an infinity pool with sunbathing areas to a cinema and tender garages that house jet skis, canoes, and even a 23-foot-long limo tender. This has got to be a joke. The sheer weight of the solar panels will render this boat useless. Solar panels work most efficiently when laid flat not at a perpendicular to the sun's rays. This is an idiotic concept and a terrible design. Thank goodness we have these designers who have the talent to create a nice, but fairly standard sailing yacht! They just leave out the fiddly little details of creating flexible solar panels that are light enough, strong enough, flexible enough, and well enough able to resist salt spray corrosion to use as sails. Using sails as solar panels is an idea that has been floating out there for decades. It’s coming some day, but not like this. At least not right away. A first step will likely involve rigid wing sails (http://en.wikipedia.org/wiki/Wingsail) covered with PV cells. This allows you to have a backing that takes the actual strain of being a sail, rather than the panel itself. Also, because rigid sails are not furled like traditional ones, you don’t need to make the panels nearly as flexible. A next step, if a next step is needed, will likely be something closer to the DynaRig concept most dramatically shown on the yacht “Maltese Falcon” (http://www.charterworld.com/news/tag/maltese-falcon) . These multitudes of smaller square sails take much less abuse than the fewer, larger sails on the featured boat. They flap less (leading to less wear on not-perfectly or infinitely flexible PV panels) and, individually, have less force put upon them. Being attached to the spars at many points, rather than just 3 another big plus. It means that you have many more options for how you actually wire your panels. Replacing these (likely) very expensive solar sails when they are worn or damaged will also be much more affordable if each one is smaller.